Two of the sections that I wold love to check out in person are Booked Up and Literary Festivals, Tours, And More. There are quite a few places near enough to me that I could visit, and one of the places I really want to check out is Hemmingway Days in Key West, Florida. It’s held annually in July. How cool would it be to take a trip to all of your favorite literary destinations? This book, as well as the first one, are a book/travel lovers dream. I will keep both books where I can pull them off the shelf from time to time and check out all the places I’d love to go. Who knows, maybe I’ll actually get to see a few of them in person. What a neat book! You always give me good suggestions for books and I will certainly be putting that on my library list! I’d love to take a trip like that! 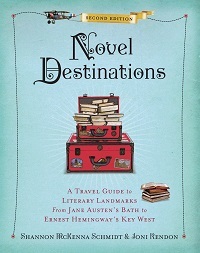 I loved Novel Destinations… need to check out this new edition! What a good idea for a book. Adding it to my wish list. Thanks so much for your kind words about Novel Destinations! I’ve been to Key West three times, visiting the Ernest Hemingway Home and Museum each time, but have yet to attend the Hemingway Days festival. That’s on my literary travel bucket list, too. I really like the idea of this book, Vicki. There is something extraordinary–magical even– about visiting places where great writers spent time. Excellent post, Vicki! I’d love to create a road trip based on this book and hit the road with friends … how fun! Ooh, I think I could make good use of this book! I have done a few ‘literary pilgrimages’ and am always looking for literary sites when I travel.